Columbia‘s Big Apple has two interesting but diverse histories. 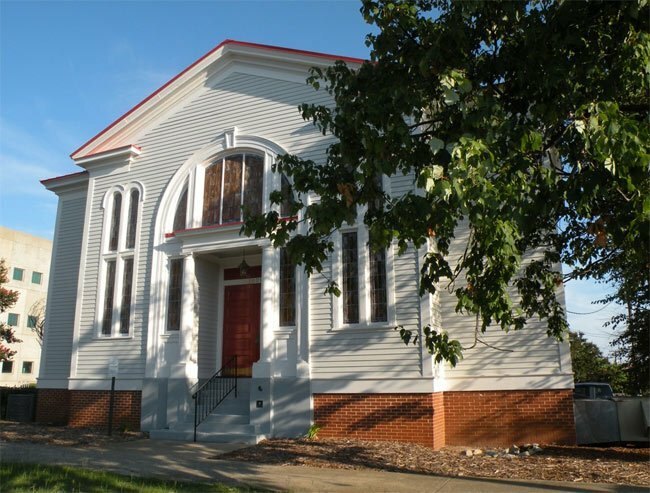 Originally built as the House of Peace Synagogue between 1907 and 1910, this two-story building served as a place of worship for the Beth Shalom Congregation for almost 30 years. 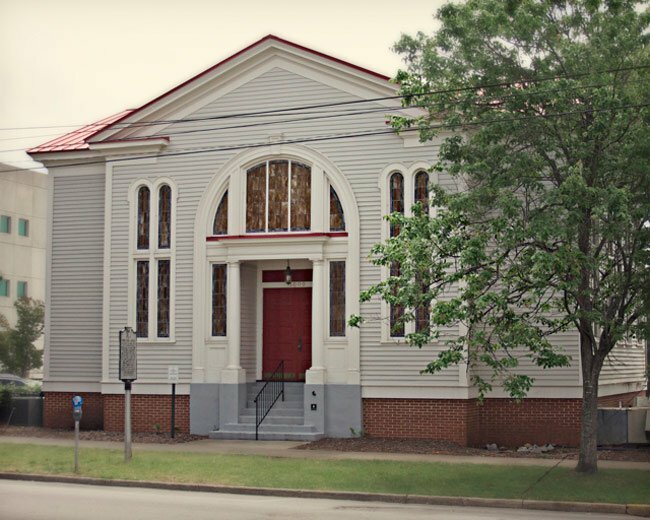 The congregation outgrew the building in 1935, and it was sold strictly on the condition that it would never again be used as a synagogue. In the 1980s, the Big Apple was moved from its original location at 1318 Park Street to the corner of Hampton and Park streets and was used as a restaurant. 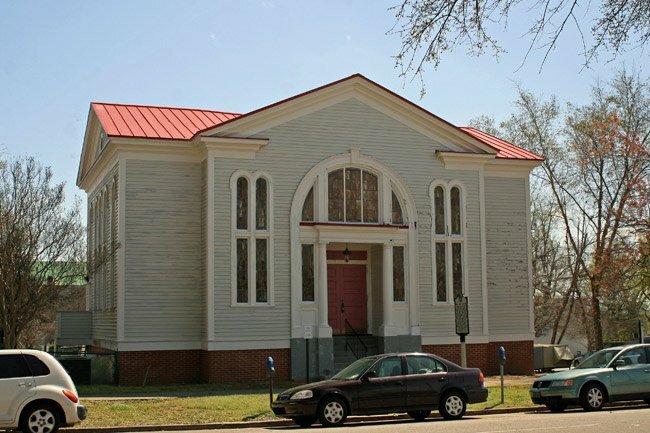 Purchased by the Historic Columbia Foundation in 1993, it hosted weddings and events until it was purchased by Richard Durlach and Breedlove in August of 2015for use as an arts venue. Although the building has undergone extensive renovations, it retains many of its original features such as the domed ceiling, horseshoe arches, and stained glass windows. 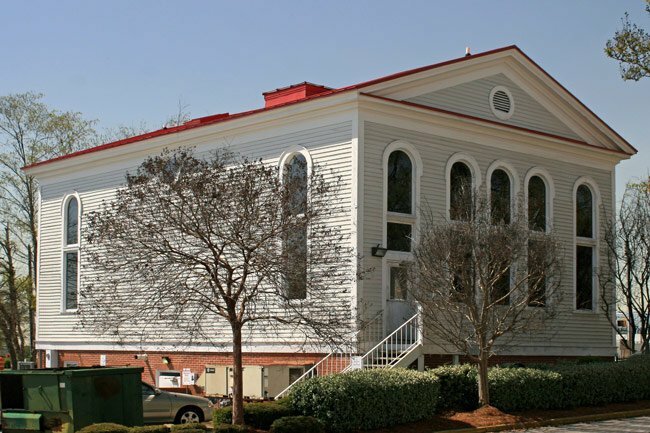 (The Big Apple) The structure located at 1318 Park Street was constructed between 1907 and 1910 as a Jewish Synagogue. Its interior architecture, including a notable recessed dome and a balcony, reflect its original function. However, the structure gained its greatest notoriety when used in the 1930s as a black nightclub. During that time, students from the nearby University of South Carolina came to observe dancers at “The Big Apple Club.” The dance, known as the Big Apple, became extremely popular and in 1937 a group of twenty-three from the Big Apple Club appeared in New York before touring the United States. After the nightclub closed, the building became a place of business and was then left vacant until its recent restoration. It is a two-story wooden edifice set upon a raised brick basement. Its gable roof is covered by tin. The structure features a projecting central entrance bay, flanked by wooden pilasters and sidelights, and surmounted by a large arch. On each side of the entrance are tall narrow windows with horseshoe arches. The side facades feature pedimented gables with a roundel. Try this email: badc.columbia@gmail.com Hopefully, someone there can help you! I would like to know pricing on this venue for a wedding on 9/8/2018…Thank you. Hi, Terry. Below your comment is a website that should put you in touch with someone who can answer your questions about renting the Big Apple. Best of luck! I was wanting to see about the charge for renting out building for a special occasion. Thank You. I would like price for use of the building. Do you have to use a certain caterer? What about the bar? Thanks. Call 803 608-0982. Jazz Concert for the summer. I am interested in receiving rental information as well as historical information regarding the original owners of this “Big Apple” club. Very interesting story on your website.